Technically, the new Comedy Central show Corporate is a workplace comedy. But it's so much darker, weirder and universal than that. The show follows the lives of Jake and Matt, two junior executives in training at Hampton Deville. Every character on the show is a little depressed and angry about working for a soul-sucking giant multinational corporation. Matt and Jake have just enough power and money to keep working there, but not enough to make any real impact in the company. Corporate goes beyond your standard office comedy and dives into deeper themes like the capitalism, art, suicide, and even the meaninglessness of life. Corporate has a great supporting cast including Lance Reddick, Anne Dudek, Aparna Nancherla, and Baron Vaughn. Deadpan humor and satire is tough, but Corporate really nails it. 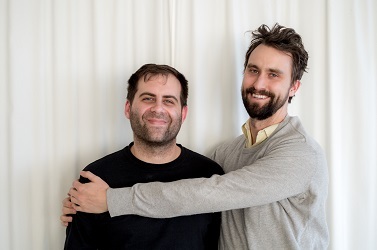 Jesse sat down with co-creators and stars of Corporate Jake Weisman and Matt Ingebretson to talk about getting the shows tone right, what it was like pitching the show to a corporation, and why they cast Lance Reddick, who played Cedric Daniels on The Wire to play the CEO of Hampton Deville. Plus, they talk about how magic mushrooms helped them write some of the episodes -- you don't wanna miss that! 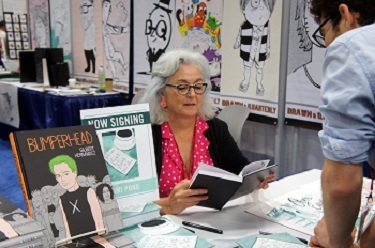 Mimi Pond is a cartoonist whose work has appeared in the National Lampoon, the LA Times, and the New York Times. For almost a decade she had a regular full page comic in Seventeen Magazine. She's also a television writer. Mimi wrote one of the most iconic episodes of the Simpsons ever made: "Simpsons Roasting on an Open Fire." In that episode, Homer doesn't get a Christmas bonus from Mr.Burns and Homer gets a job at the mall as Santa to pay for holiday expenses. The episode introduced us to the Simpson's family dog, Santa's Little Helper. That episode also introduced the world to the Simpsons -- it was the first episode of The Simpsons to air on television. Mimi's also written for Pee-Wee's Playhouse and Designing Women. Before all that, Mimi worked at a handful of diners in the 70's as a waitress. She's written two graphic novels loosely based on her time as a server. The first was "Over Easy" in 2014 and the most recent is "The Customer is Always Wrong." We asked her to tell us about the craziest day of her career, and she had a lot to say about one particular dinner shift when the head cook disappeared. Mimi Pond's book "The Customer is Always Wrong" is out now. 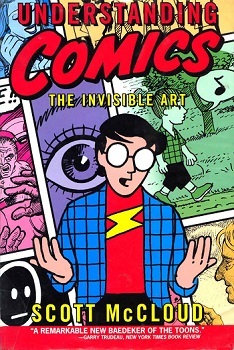 Finally, for this week's Outshot: "Understanding Comics" by Scott McCloud. It's a graphic novel about understanding comic books that assumes you know nothing about comics. If you've never picked up a comic book before this is a good place to start. Matt Ingebretson (@mattingebretson) & Jake Weisman (@weismanjake) join the ladies to talk about their new show Corporate on Comedy Central and Tess starts the new year with a special announcement. They talk about how surreal it is to be on billboards and the best graffiti they've seen drawn on their faces so far as well as the the best names for private parts. Produced by Kailynn West, booker Marie Colette, theme song Zach Ames. Laura Kightlinger (@KingKightlinger) joins the ladies to discuss pizza, lexapro, Underground Abortion Railroad, the guy with two dicks, New Years Eve, Larry David and more! Then, the ladies are joined by Gert Bertly (@mattingebretson) who tells about his long road to recovery after jumping out of the window of the Christmas party. Produced by David Janove, theme song by Zach Ames.